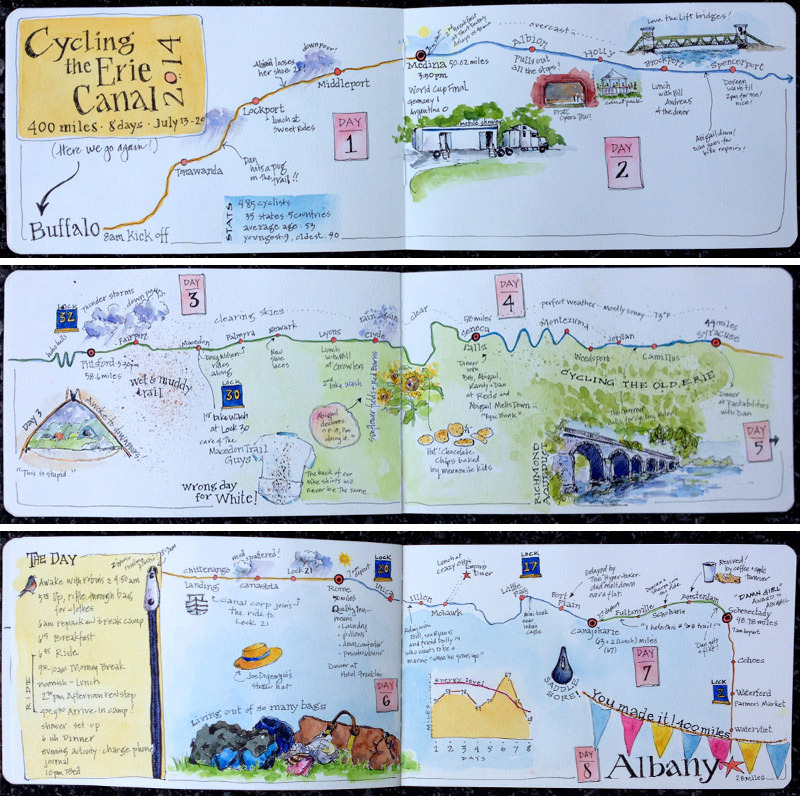 An eight-day, 400-mile bicycle tour along the Erie Canalway Trail from Buffalo wrapped up this weekend in Albany. More than 500 cyclists began the 16th annual statewide trip last Sunday, covering between 40 and 60 miles a day. The trip came to an end Sunday at the Albany Visitors Center. Cyclists making the trip ranged in age from 9 to 90, and came from far away as Australia and Israel. A 400-mile bicycle tour along the Erie Canalway Trail from Buffalo to Albany is scheduled to wrap up this weekend. More than 500 cyclists began the 16th annual statewide trip last Sunday, covering between 40 and 60 miles a day. They are scheduled to finish this Sunday at the Albany Visitors Center. Here’s the long and short of it on the 16th annual Cycling the Erie Canal — for some like the first-timer 9-year-old from Brooklyn it’s a big thing and for others, well, not so big. Although some got caught in rain Thursday, most were enjoying the sunshine in Rome as they set up camp on the lawn at Fort Stanwix. More than 500 cyclists kicked off the 16th annual statewide Cycling the Erie Canal Sunday, a 400-mile bicycling tour from Buffalo to Albany concluding this Sunday. Riders will arrive in Rome Thursday and depart Friday morning.The Rome Area Chamber of Commerce has issued its annual guide for cyclists. It outlines the schedule, attractions, where to eat and details for the shuttle bus service offered. Riders will camp on the west lawn at Fort Stanwix National Monument. The annual "Cycling the Erie Canal Bike Tour," brought cyclists through central New York, Thursday. Some 500 bikers are spending eight days traveling 400 miles across New York State, starting off in Buffalo and riding through towns along the canal until they get to Albany. Thirty miles into their fifth day of riding, more than four hundred bikers on the Erie Canal Trailway Tour were greeted by members of the Greater Oneida Area Chamber of Commerce, Oneida Rail Trail Committee and Parks and Recreation just outside Oneida. More than 500 cyclists will be coming through Chittenango, Canastota, Wampsville, and Oneida on Thursday, July 17 as part of the 16thAnnual Cycling the Erie Canal Bike Tour. This is an opportunity to roll out the welcome mat and showcase our local businesses and area attractions. After a big welcome reception in Medina on Sunday night, about 500 cyclists on the Erie Canal are being treated today to refreshments and greetings in Albion and Holley. The top photo shows a group of cyclists by two welcome tents in Albion. On July 13, more than 500 cyclists began pedaling along the historic Erie Canalway Trail from Buffalo to Albany.They arrive in Syracuse today, July 16, halfway on the 16th annual 400-mile Cycling the Erie Canal tour, organized by the statewide nonprofit Parks & Trails New York. At 3:45 p.m., the cyclists will stop at Rosamond Gifford Zoo for a half-way point celebration. Bicyclists of all ages continued their trek Monday as they ride 400 miles along the Erie Canal, rolling into Genesee Valley Park in Rochester. "It's a really nice way to be outdoors," said New Jersey resident Priscilla Hayes. "Me and my dad, we really trained hard for it and I know I can do it," said 10-year-old Anika Galkiewicz, an Albany resident. These bikers will spend the next eight days traveling to Albany as part of the Cycling the Erie Canal Tour. The tour, which began Sunday in Buffalo, is meant to bring awareness to the canal. More than 500 bicyclists have registered for the annual Cycling the Erie Canal ride, a 400-mile tour that starts in Buffalo on Sunday and ends on Sunday, July 20, in Albany. The tour, which highlights the beauty, history, culture and recreational appeal of the canal system and the Canalway Trail, has attracted cyclists from 36 states and some foreign nations. Many New Yorkers who live along the Erie Canal are rediscovering the waterway via long-distance bicycle trips. The recreational trail along the canal is becoming a well-used resource by people living in towns that were built by the canal. And they’re spending money too. A survey by Parks and Trails New York finds a million and a half people take to the Erie Canal Trail every year. A large majority, nearly 90 percent, of those are bikers. On Monday, Parks and Trails New York released a new report on the Erie Canalway Trail demonstrating an economic impact of $253 million, from a volume of 1.58 million visits a year, and supporting 3,440 jobs in local economies along the trail. The report announcement coincided with PTNY’s 16th annual Erie Canal Ride, a nearly-400-mile, eight-day event that this year attracted 500 cyclists from 35 states and four countries. The canal ride began in Buffalo and will finish in Albany on Sunday. Erie Canal Bike Tour cyclists whizzed by Schoen Place in Pittsford Monday as Parks & Trails New York officials announced the results of a study tallying the 1.5 million visitors and $250 million in revenue that the Erie Canal brings to upstate every year. Though it runs some 360 miles without a crossroads, the Erie Canal still has many important intersections: recreation and economic impact, for example, or tourism and historic attraction. Its spiraling popularity must be matched by legislative support in the form of passage of pending legislation to extend its designation as a National Heritage Corridor.